This post contains major spoilers for Game of Thrones Season 7, Episode 5, "Eastwatch," and every episode before it. Visit our "Beyond the Wall" hub for more GoT recaps, theories, and spoilers. Cersei Lannister is pregnant. At least, she claims to be, on this week’s Game of Thrones episode, "Eastwatch." If it’s true, it’s certainly convenient. 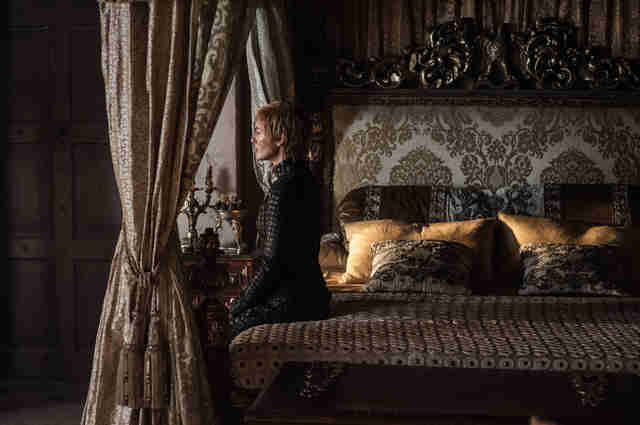 As Jaime’s allegiance begins to wane -- after Daenerys’s devastating attack on his men, the warning words of Bronn and Olenna, and a fraught encounter with Tyrion -- Cersei drops the news, affectionately rubbing her tummy, and reminding Jaime of their father’s words: "The lion does not concern himself with the opinions of the sheep." This baby, she insinuates, will be different than the others. Joffrey, Mycella, and Tommen all died with the false Baratheon identifier. Now that Cersei is queen, the truth of their union can live in the open. After all, the Targaryen dynasty was marked with intermarriage and inbred children. Why should the Lannisters be any different? That’s assuming this child isn't the concoction of a manic ruler desperate for control. Cersei is most certainly that. Her armies are outnumbered, loyalties are dwindling, and Daenerys’s dragons -- not to mention her Dothraki horde -- are a dark and impenetrable shadow in the distance. Real or not, the baby’s an easy way to trap the gullible and lovesick Jaime in her web. 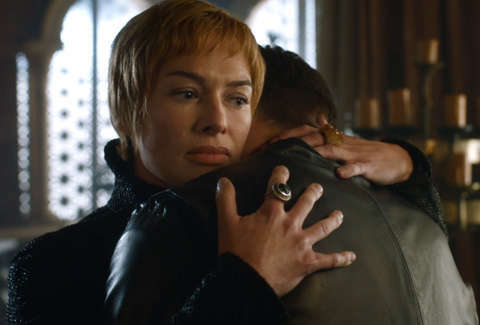 It’s also yet another way to draw a connection between Cersei and the Mad King Aerys, whose daughter Daenerys may have a fiery temper, but is still kind of heart and inspiring to her devoted. Cersei, on the other hand, is loathed and loathing, trigger-happy and prone to torture. The Mad King’s ghost still haunts the Red Keep. The last time a Mad King sat the Iron Throne, he was slain by Jaime Lannister. Is Game of Thrones setting the stage for a similar scenario, or is it all a massive red herring? 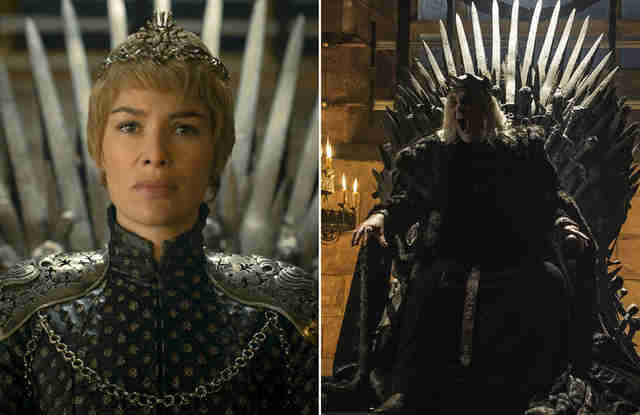 Who was the Mad King and how is Cersei like him? Aerys II was the last Targaryen to rule Westeros before Robert’s Rebellion put an end to their dynasty. He was known throughout the kingdom for his short temper, deep paranoia, and violent outbursts, earning the nickname, the "Mad King." Though the Rebellion was sparked by Aerys’s son Rhaegar and his affair with Lyanna Stark, the Mad King escalated conflicts when he arrested Lyanna’s brother Brandon and father Rickard and murdered them in the Red Keep. His method – burning Rickard with wildfire while Brandon watched, strangling himself to death in the process – is reminiscent of what Cersei did to Ellaria and Tyene this season, with a mother helplessly forced to watch her daughter die. Like Aerys, Cersei also has a fondness for wildfire. She used the lethal liquid to blow up the Sept of Baelor and everyone inside – including most of the Tyrells. Cersei’s sexual response to violence is another commonality with Aerys. Just as Cersei ran to Jaime after locking Ellaria and Tyene away, the Mad King would bed his wife after burning his enemies. And, just like Cersei and Jaime, the Mad King and his wife were brother and sister. Will Jaime kill Cersei, as he did the Mad King? Robert’s Rebellion was effectively ended the day Jaime ignored his duty as a member of the royal Kingsguard and drew his sword on Aerys, killing him. Though the act earned him the title of "Kingslayer" and much derision across the land, it was a humanitarian effort – in his final moments, the Mad King threatened to burn the city of King’s Landing with wildfire to prevent the Lannister army from sacking it. Jaime kept that detail secret, as it would presumably weaken his tough guy exterior. But the goodness in Jaime – however buried – has a way of poking through. This is why his proximity to Cersei could spell her doom. There’s another big book clue that hints at Cersei’s fate: the Valonqar theory. "Oh, aye. Six-and-ten for him, and three for you. Gold shall be their crowns and gold their shrouds … And when your tears have drowned you, the valonqar shall wrap his hands about your pale white throat and choke the life from you." The "six-and-ten for him" bit refers to Robert’s bastards, and the part about gold shrouds foreshadows the death of Cersei’s children. 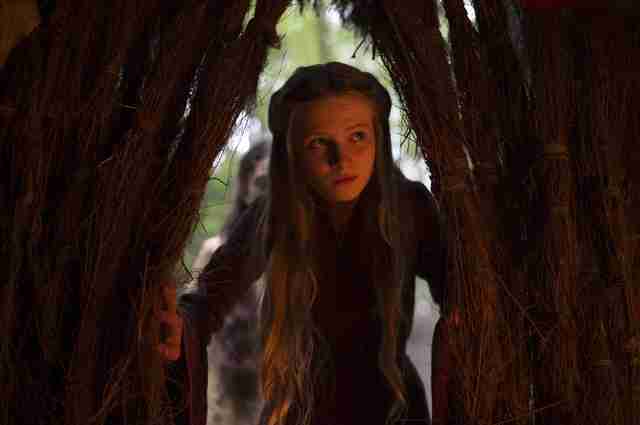 But most curious is the use of valonqar, the High Valyrian word for "little brother." In the books, Cersei assumes that Tyrion will murder her, which is partly why she spites him. But fans have long predicted that valonqar might instead refer to Jaime, the younger twin, the person Cersei loves most. "We came into this world together, we belong together," she said in Season 1. Will they leave this world together, too? Will Cersei even have the child? Even if the pregnancy is real, it seems pretty unlikely that Cersei will give birth. The valonqar part of the prophecy was left off the show, but the "three for you" portion was stated by the fortune-telling Maggy in Season 5. Given her accuracy about Robert’s bastards and Cersei’s other children, surely she would have foreseen this child, too. If Cersei is pregnant but miscarries, the unfortunate circumstance is another parallel to the Mad King. His sister-wife, Rhaella, suffered countless miscarriages before Daenerys was conceived, which furthered her husband’s paranoia and madness. A miscarriage might drive Cersei over the edge, as the last hope of the Lannister legacy dies out. Might this spark a violent act that finally convinces Jaime to end her? Or will Tyrion – with Daenerys – be the one to kill her after all? Whatever the case, the clock is ticking on Cersei’s reign.